This week our featured fanart is “Bunch of Koroks” by deviantART artist squish-squash. The subject of this piece is of course the adorable Korok race from Wind Waker, who I must say are portrayed adorably, but what really caught my eye about this piece are two things: the color scheme and the style. The color palette really suits the subject well, all light and happy with the feel of spring in the air. 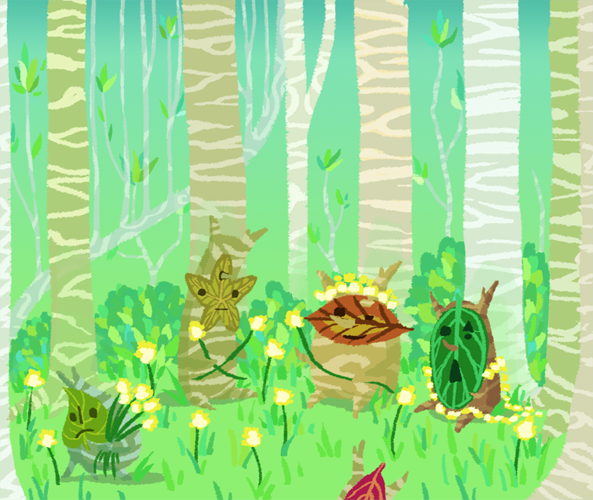 And of course the style is also perfectly suited to the piece; the lineless and almost crayon-like texture feel like something out of a child’s picture book, which is absolutely perfect given how adorable these Koroks are. What do you guys think?